Nothing says summertime like an afternoon at the ballpark. 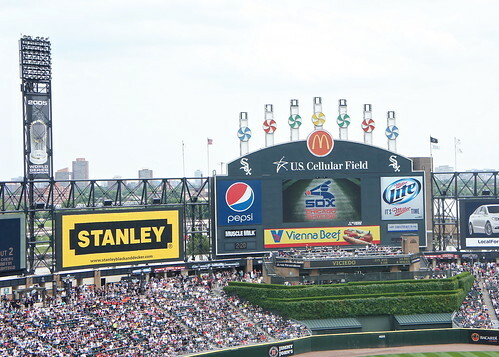 Since we're Chicago south-siders now, last weekend we decided to cheer on the White Sox and continue our stadium tour. 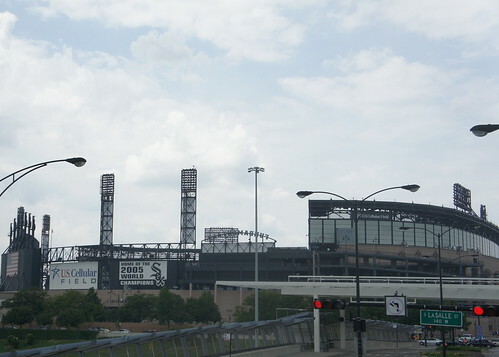 The White Sox play at U.S. Cellular field which, it turns out, is just a 15ish minute bus ride from our place in the South Loop. We headed to the park early to make sure we had plenty of time to get some Sox gear before we made the trek up to our seats. As always, what we ate during the game was just as important as what happened on the field. I can report that both resulted in happy endings. 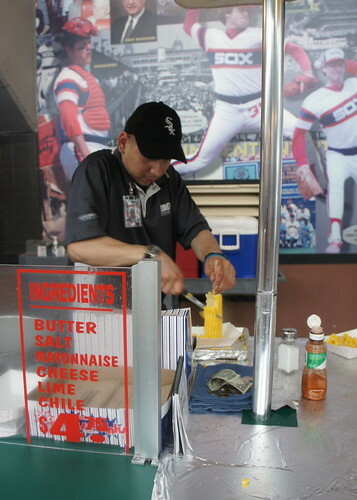 Hot dogs, Nachos and a special U.S. Cellular treat, corn off the cob, were on the menu and the Sox won. We had literally nothing to complain about. But during the fourth inning something happened for which I had no frame of reference. One of the Sox players, Adam Dunn, came up to bat and the entire crowd started to boo. I was completely confused. Why were they booing their own player? And it didn't stop there. The 4 tween boys in front of us started to heckle him. Like, SERIOUSLY heckle him. They were unmerciful. They were unrelenting. They were hysterical. Now, I was born and raised in Cardinal nation. We are loyal fans. We love our boys of summer (Unless they ditch us for LA - Just ask Pujols). I have never seen a home crowd boo or taunt their own player. In fact, Cardinals fans rarely boo opposing players! At first, I was mortified. But then I couldn't help laughing. Chicago is a tough town. Apparently Dunn hadn't been producing and so the fans made it known that they were disappointed. Loudly. As a side note, Dunn hit 2 home runs on Wednesday, so maybe the tough love worked. Regardless it was an eye opening and entertaining experience. 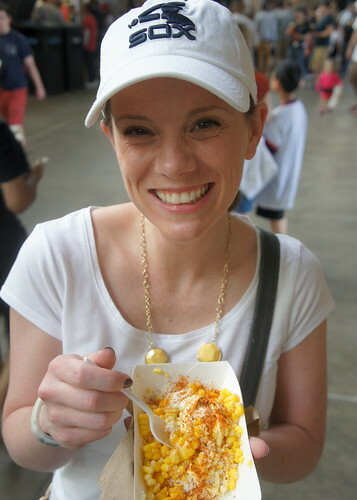 Hot Dog: Obviously, the Comiskey Dogs (Just Chicago Dogs by another name) were fantastic. Nachos: Pulled pork Nachos were okay. Is it strange to say we were hoping for neon yellow cheese sauce and were disappointed with the sprinkle cheese that we got instead? Unique to The Cell: We bought seats in the upper deck and weren't even allowed to VISIT or check out the stadium at field level! They definitely kept us, the unwashed peons, separated from the fancy folks. Do you have any plans to catch a ballgame this summer?